Mitsubishi Motors Corporation (Japanese: 三菱自動車工業株式会社, Hepburn: Mitsubishi Jidōsha Kōgyō KK, IPA: [mitsɯꜜbiɕi]) is a Japanese multinational automotive manufacturer headquartered in Minato, Tokyo, Japan. In 2011, Mitsubishi Motors was the sixth-biggest Japanese automaker and the nineteenth-biggest worldwide by production. From October 2016 onwards, Mitsubishi has been one-third (34%) owned by Nissan, and thus a part of the Renault–Nissan–Mitsubishi Alliance. Besides being part of the Renault–Nissan–Mitsubishi Alliance, it is also a part of Mitsubishi keiretsu, formerly the biggest industrial group in Japan, and the company was originally formed in 1970 from the automotive division of Mitsubishi Heavy Industries. Mitsubishi Fuso Truck and Bus Corporation, which builds commercial grade trucks, buses and heavy construction equipment, was formerly a part of Mitsubishi Motors, but is now separate from Mitsubishi Motors, and is owned by the German automotive corporation Daimler AG (though Mitsubishi continues to own a small stake). Mitsubishi's automotive origins date back to 1917, when the Mitsubishi Shipbuilding Co., Ltd. introduced the Mitsubishi Model A, Japan's first series-production automobile. An entirely hand-built seven-seater sedan based on the Fiat Tipo 3, it proved expensive compared to its American and European mass-produced rivals, and was discontinued in 1921 after only 22 had been built. A 1937 Mitsubishi PX33 on display at the Mondial de l'Automobile in September 2006. East Japan Heavy-Industries began importing the Henry J, an inexpensive American sedan built by Kaiser Motors, in knockdown kit (CKD) form in 1951, and continued to bring them to Japan for the remainder of the car's three-year production run. The same year, Central Japan Heavy-Industries concluded a similar contract with Willys (now owned by Kaiser) for CKD-assembled Jeep CJ-3Bs. This deal proved more durable, with licensed Mitsubishi Jeeps in production until 1998, thirty years after Willys themselves had replaced the model. By the beginning of the 1960s Japan's economy was gearing up; wages were rising and the idea of family motoring was taking off. 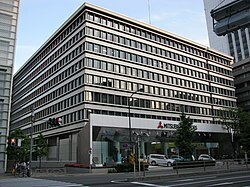 Central Japan Heavy-Industries, now known as Shin Mitsubishi Heavy-Industries, had already re-established an automotive department in its headquarters in 1953. Now it was ready to introduce the Mitsubishi 500, a mass-market sedan, to meet the new demand from consumers. It followed this in 1962 with the Minica kei car and the Colt 1000, the first of its Colt line of family cars, in 1963. In 1964, Mitsubishi introduced its largest passenger sedan, the Mitsubishi Debonair as a luxury car primarily for the Japanese market, and was used by senior Mitsubishi executives as a company car. The logo of three red diamonds, shared with over forty other companies within the keiretsu, predates Mitsubishi Motors itself by almost a century. It was chosen by Iwasaki Yatarō, the founder of Mitsubishi, as it was suggestive of the emblem of the Tosa Clan who first employed him, and because his own family crest was three rhombuses stacked atop each other. The name Mitsubishi (三菱) consists of two parts: "mitsu" meaning "three" and "hishi" (which becomes "bishi" under rendaku) meaning "water caltrop" (also called "water chestnut"), and hence "rhombus", which is reflected in the company's logo..
Part of Mr. Kubo's expansion strategy was to increase exports by forging alliances with well-established foreign companies. Therefore, in 1971 MHI sold U.S. automotive giant Chrysler a 15 percent share in the new company. Thanks to this deal, Chrysler began selling the Galant in the United States as the Dodge Colt (which was the first rebadged Mitsubishi product sold by Chrysler), pushing MMC's annual production beyond 250,000 vehicles. 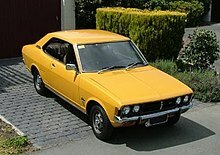 In 1977, the Galant was sold as the Chrysler Sigma in Australia. A 1973 Mitsubishi Galant, the basis for the company's first captive import deal with Chrysler. In 1982, the Mitsubishi brand was introduced to the American market for the first time. The Tredia sedan, and the Cordia and Starion coupés, were initially sold through seventy dealers in 22 states, with an allocation of 30,000 vehicles between them. This quota, restricted by mutual agreement between the two countries' governments, had to be included among the 120,000 cars earmarked for Chrysler. Toward the end of the 1980s, as MMC initiated a major push to increase its U.S. presence, it aired its first national television advertising campaign, and made plans to increase its dealer network to 340 dealers. In 1986 Mitsubishi reached an agreement with Liuzhou Automotive to assemble their Minicab kei van and truck there, making Mitsubishi the third Japanese manufacturer (after Daihatsu and Suzuki) to begin assembly in China. Before receiving government approval for this project, Mitsubishi had to express contrition over "defective" Mitsubishi trucks imported to China in 1984 and 1985. By 1989, Mitsubishi's worldwide production, including its overseas affiliates, had reached 1.5 million units. A 1984 Mitsubishi Pajero, the company's most successful SUV. Despite the ongoing tensions between Chrysler and Mitsubishi, they agreed to unite in a vehicle manufacturing operation in Normal, Illinois. The 50/50 venture provided a way to circumvent the voluntary import restrictions, while providing a new line of compact and subcompact cars for Chrysler. Diamond-Star Motors (DSM)—from the parent companies' logos: three diamonds (Mitsubishi) and a pentastar (Chrysler)—was incorporated in October 1985, and in April 1986 ground was broken on a 1.9 million square-foot (177,000 m2) production facility. In 1987, the company was selling 67,000 cars a year in the U.S., but when the plant was completed in March 1988 it offered an annual capacity of 240,000 vehicles. Initially, three platform-sharing compact 2+2 coupés were released, the Mitsubishi Eclipse, Eagle Talon and Plymouth Laser, with other models being introduced in subsequent years. Hirokazu Nakamura became president of Mitsubishi in 1989 and steered the company in some promising directions, with the advent of the Japanese asset price bubble "market correction" that led to the Lost Decade as a result of the Plaza Accord agreement signed in 1985. Sales of the company's new Pajero were bucking conventional wisdom by becoming popular even in the crowded streets of Japan. It was heavily rumored by Japanese media, in 1992 and 1993, that Mitsubishi Motors intended a hostile acquisition of Honda. While Mitsubishi was riding high off of profitable vehicles such as the Diamante and Pajero, Honda was caught off-guard with the SUV and truck boom and was losing focus after the illness and later death of its founder. However, Honda CEO Nobuhiko Kawamoto took drastic steps, such as exiting Formula 1 and discontinuing unprofitable vehicles to avert a Mitsubishi takeover, which proved effective. Although sales of SUVs and light trucks were booming in the U.S., Japan's car manufacturers dismissed the idea that such a trend could occur in their own country. Nakamura, however, increased the budget for sport utility product development, and his gamble paid off; Mitsubishi's wide line of four-wheel drive vehicles, from the Mitsubishi Pajero Mini kei car to the Delica Space Gear passenger van, rode the wave of SUV-buying in Japan in the early to mid-1990s, and Mitsubishi saw its overall domestic share rise to 11.6 percent in 1995. In 1991, Chrysler sold its equity stake in Diamond-Star Motors to its partner Mitsubishi, and from then on the two companies continued to share components and manufacturing on a contractual basis only. Chrysler decreased its interest in Mitsubishi Motors to less than three percent in 1992, and announced its decision to divest itself of all its remaining shares on the open market in 1993. The two companies then terminated their close alliance, with Mitsubishi no longer supplying parts for engines and transmissions for Chrysler. After this period, Mitsubishi sought alliances with many other automotive manufacturers in different areas of the world, as described under "other alliances" below, with its most economically significant alliance being with Nissan to develop and manufacture kei cars. In May 2016, in the wake of the fuel efficiency scandal uncovered by Nissan (discussed in "Fuel economy scandal"), Nissan began the acquisition of a 34% stake in Mitsubishi Motors, with the aim of making Nissan the largest and controlling shareholder of Mitsubishi and turning Mitsubishi into a member of the Renault–Nissan Alliance (the "Alliance"). Nissan has said that they plan to share some car platforms and jointly develop future vehicles with Mitsubishi Motors. Nissan's acquisition of the 34% controlling interest in Mitsubishi was completed in October 2016, at which time Carlos Ghosn, the chairman of Nissan, Renault, and the Alliance, also became chairman of Mitsubishi. Ghosn remained chairman of Mitsubishi until his dismissal following his arrest by the Japanese government in November 2018, at which time Mitsubishi CEO Osamu Masuko assumed the chairmanship. Mitsubishi participated in a joint venture with rival car-maker Volvo and the Dutch government at the former DAF plant in Born in 1991. The operation, branded NedCar, began producing the first generation Mitsubishi Carisma alongside the Volvo S40/V40 in 1996. The factory later produced the latest Mitsubishi Colt and the related Smart Forfour (partner DaimlerChrysler cancelled its production in 2006). Production of European market-bound Mitsubishi Outlanders, and badge engineered versions of this vehicle, were also manufactured in the Netherlands until 2012, when the company sold the plant to the Dutch coach manufacturer VDL Groep. Upon selling its Volvo Cars division to Ford in January 1999, Volvo Group purchased a 5% stake in Mitsubishi Motors in November of that same year, but sold its stake to shareholder DaimlerChrysler in March 2001. Mitsubishi has been allied with Groupe PSA since 1999, after they agreed to co-operate on the development of diesel engines using the Japanese company's gasoline direct injection (GDI) technology. They united again in 2005 to develop the Peugeot 4007 and Citroën C-Crosser sport utility vehicles (SUVs), based on the Japanese company's Mitsubishi Outlander. Two further ties were established between the companies in 2008, first with the establishment of a jointly owned production facility in Kaluga which will manufacture up to 160,000 Outlander-based SUVs for the fast-growing Russian market. They are also collaborating in the research and development of electric powertrains for small urban vehicles. Japanese newspaper Nikkei claims that PSA will sell the electric city car Mitsubishi i MIEV in Europe by 2011. In Europe, Mitsubishi Motors used diesel engines supplied by the German manufacturer Volkswagen for some of its mid-sized cars, such as the Lancer, Grandis, and Outlander. From 2010, they were superseded with Mitsubishi's own developed 4N1 diesel engine. In 1982 and 1983, Mitsubishi introduced the Australian-built Mitsubishi Sigma to the UK as the Lonsdale Sigma in an attempt to circumvent British import quotas, but the new brand was unsuccessful. It then carried Mitsubishi Sigma badges in 1983–84 before abandoning this operation entirely. South Korean manufacturer Hyundai, built the Hyundai Pony in 1975 using MMC's Saturn engine and transmissions. 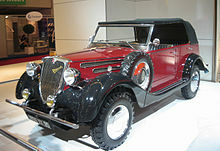 Korea's first car, it remained in production for thirteen years. Mitsubishi held up to a 10 percent stake in the company, until disposing of the last of its remaining shares in March 2003. The 1985 Hyundai Excel was sold in the United States as the Mitsubishi Precis between 1987 and 1994, whereas several other Mitsubishi models were rebadged as Hyundai, namely the Mitsubishi Chariot (as the Hyundai Santamo), the Mitsubishi Pajero (as the Hyundai Galloper) or the Mitsubishi Delica (as the Hyundai Porter) and Mitsubishi Proudia(as the Hyundai Equus). Indian manufacturer Hindustan had a joint venture with Mitsubishi that started 1998. The plant is located in Tiruvallur, Tamil Nadu. Models produced include: Mitsubishi Pajero Sport (third generation) until 2016. The South African Motor Corporation (Samcor) was a joint venture created in 1985, which produced Ford, Mazda and Mitsubishi vehicles for the local South African market, with the Mitsubishi Delica being rebadged as the Ford Husky and the Mitsubishi Canter as the Ford Triton. Mitsubishi Motors maintained two retail sales channels that sold specific models, called "Car Plaza" and "Galant Shop". Certain models were exclusive to either channel, while some models were available at both channels, as required by local Japanese market conditions. More recently, due to cancellation of larger sedans, the sales channels have been combined into one franchise that sell all models, including kei cars and commercial delivery vehicles. In December 2010, Mitsubishi and Nissan agreed to form a joint venture (later named "NMKV Co., Ltd.") to develop kei cars for the Japanese market.. In 2016, Nissan uncovered evidence that Mitsubishi's fuel economy testing numbers were erroneous and had been erroneous since the start of the venture, affecting 625,000 cars produced by NMKV. The result of the "fuel economy scandal" was that Nissan acquired a controlling interest in Mitsubishi, as detailed under "Membership in Renault-Nissan-Mitsubishi Alliance". The benefits Mitsubishi had seen because of its strong presence in south-east Asia reversed themselves as a result of the economic crisis in the region which began in 1991 with the advent of the collapse of the Japanese asset price bubble, referred to in Japan as the beginning of the Lost Decade and continued to 1997. The collapse was partly the result of the Plaza Accord agreement in 1985, which sought to equalize the United States dollar with the Japanese yen and the German mark. In September of that year the company closed its Thai factory in response to a crash in the country's currency and plummeting consumer demand. The large truck plant, which had produced 8,700 trucks in 1996, was shut down indefinitely. In addition, Mitsubishi had little support from sales in Japan, which slowed considerably throughout 1997 and were affected by that country's own economic uncertainty into 1998. Other Japanese automakers, such as Toyota and Honda, bolstered their own slipping domestic sales with success in the U.S. However, with a comparatively small percentage of the American market, the impact of the turmoil in the Asian economy had a greater effect on Mitsubishi, and the company's 1997 losses were the worst in its history. In addition, it lost both its rank as the third largest automaker in Japan to Mazda, and market share overseas. Its stock price fell precipitously, prompting the company to cancel its year-end dividend payment. In what was referred to as "one of the largest corporate scandals in Japanese history", Mitsubishi was twice forced to admit to systematically covering up defect problems in its vehicles. Four defects were first publicised in 2000, but in 2004 it confessed to 26 more going back as far as 1977, including failing brakes, fuel leaks and malfunctioning clutches. The effect on the company was catastrophic, forcing it to recall 163,707 cars (156,433 in Japan and 7,274 overseas) for free repair. Further recalls by Fuso truck & bus brought the total number of vehicles requiring repair to almost one million. The affair led to the resignation and subsequent arrest of president Kawasoe, along with 23 other employees who were also implicated. Three of them have since been acquitted, with the judge stating that there was no official request from the Transport Ministry ordering them to submit a defect report. In an effort to boost sales in the U.S. in the early 2000s, Mitsubishi began offering a "0–0–0" finance offer—0% down, 0% interest, and $0 monthly payments (all repayments deferred for 12 months). Initially, sales leapt, but at the end of the year's "grace period" numerous credit-risky buyers defaulted, leaving Mitsubishi with used vehicles for which they had received no money and which were now worth less than they cost to manufacture. The company's American credit operation, MMCA, was eventually forced to make a US$454 million provision against its 2003 accounts as a result of these losses. As a result, sales plummeted to 243,000 in 2003, 139,000 in 2004, 124,000 in 2005, and 119,000 in 2006. In October 2005, Mitsubishi Motors Australia introduced the Mitsubishi 380 to the Australian market as the replacement for its long-running Mitsubishi Magna, and the sole vehicle being built at its Australian assembly plant at Clovelly Park. Despite an investment of A$600 million developing the car, initial sales projections proved optimistic; after only six months Mitsubishi scaled back production from 90/day, and reduced the working week from five days to four. It remained an ongoing concern in the Australian auto industry as to whether this would be sufficient to restore the plant to profitability and ensure its long-term survival. The drop in local sales could not be mitigated by exports outside of the Australian and New Zealand market. On 5 February 2008, Mitsubishi Motors Australia announced it would be closing down its Adelaide assembly plant by the end of March. Between 700 and 1,000 direct jobs would be lost and up to 2,000 jobs will be lost in industries supporting Mitsubishi's local manufacturing operations. With operating losses ¥22 billion ($287 million) in Europe for the fiscal year to March due to stagnant sales in a continent beset by uncertainty of a raging debt crisis, finally in February 2012 Mitsubishi have decided to withdraw production in Europe by the end of 2012. On 1 October, it was announced that the Dutch industrial conglomerate VDL Groep had taken over NedCar from Mitsubishi, retaining all 1,500 employees. In 1988, Mitsubishi opened a production facility in the United States in Normal, Illinois. The facility was known as Diamond-Star Motors and was initially a joint venture with Chrysler, however Chrysler sold its stake in the plant to Mitsubishi in 1993. After 1995 the facility was known as Mitsubishi Motors Manufacturing America (MMMA). At its peak in 2000, the facility produced over 222,000 vehicles per year, however following the decline of Mitsubishi in North America, the plant operated well below capacity for years. Finally, in July 2015, Mitsubishi announced that it would close the plant by November, but would continue to sell automobiles in North America. In 2014, the plant had produced just 69,000 vehicles, roughly one quarter of its capacity. Production at the plant ended on 30 November 2015, and most of the employees were laid off. The plant continued to operate with a minimal staff to produce replacement parts until May 2016, after which it closed permanently. In early 2016, Mitsubishi partner Nissan found discrepancies between Mitsubishi information and actual fuel consumption while working in new micro cars for both companies, the eK Wagon, eK Space, Nissan Dayz and Nissan Dayz Roox. At the time, Mitsubishi manufactured micro cars ("kei cars") for Nissan, which had never produced that class of vehicle itself. Mitsubishi admitted that they had been giving wrong information on fuel consumption from 2002 onwards, using inaccurate test methods. Later, the company said it used fuel economy testing methods that did not comply with Japanese regulations for 25 years, much longer than previously known. Mitsubishi management said they did not know about the issue and that the wrong information came from the micro car development department. They ordered an investigation led by investigators not affiliated with the company. The resultant scandal culminated in Nissan acquiring a controlling interest in MMC in May 2016. As a consequence, Nissan agreed to invest 237.4 billion yen (US$2.2 billion) in exchange for receiving a 34% controlling ownership stake in Mitsubishi Motors. Due to dilution of existing shares, other Mitsubishi group companies (Mitsubishi Heavy Industries, Mitsubishi Corp., and Bank of Tokyo-Mitsubishi UFJ) will see their combined holdings in Mitsubishi Motors fall to about 20% from 34% currently. Mitsubishi Motors North America stated that vehicles sold from 2013 in the United States featured accurate fuel economy information and were thereby not affected by the scandal. In May 2016, Mitsubishi Motors announced Tetsuro Aikawa to resign as the president of the company in effect on June. Both Mitsubishi Motors and Aikawa denied any top management involvement in the mileage scandal. The company said much of the mileage-testing work was assigned to a subsidiary and there was a lack of scrutiny of such work. Slow selling vehicles were eliminated from the U.S. market, purchase projections for the Global Engine Manufacturing Alliance have been scaled back, and 10,000 jobs have been shed to cut costs with 3,400 workers at its Australian plant and other loss-making operations still under threat. Meanwhile, in an effort to increase production at its U.S. facility, new export markets for the Eclipse and Galant are being explored in Ukraine, the Middle East, and Russia, where the company's bestselling dealership is located. Mitsubishi has also been active in OEM production of cars for Nissan, and announced a similar partnership with Groupe PSA in July 2005 to manufacture an SUV on their behalf. In January 2011, the company announced its next mid-term business plan to introduce eight hybrid and battery-powered models by 2015. It aimed to sell its first two plug-in hybrids by fiscal 2012. In May 2016 Nissan announced a controlling purchase of Mitsubishi Motors for an estimated 2 billion U.S. dollars. Nissan stated that there are no major changes planned for Mitsubishi Motors and sharing of technologies and platforms can be expected between the two automobile manufactures. In 2014 Tetsuro Aikawa was appointed as the president of the company, becoming the first in more than a decade to have spent an entire career at the company. The career of Aikawa had been mainly in product development although he was involved in manufacturing and Japan domestic sales lately. Osamu Masuko, the previous president, joined the company from Mitsubishi Corp. in 2004. MMC endured eight presidents between 1989 and 2004. Mitsubishi Motors aims to cut the price of its electric vehicles to 2 million yen ($21,890) by fiscal 2012—down 30 percent. Mitsubishi has almost half a century of international motorsport experience, predating even the incorporation of MMC. Beginning with street races in the early 1960s, the company found itself gravitating towards the challenge of off-road racing. It dominated endurance rallies in the 1970s, the Dakar Rally from the '80s, and the Group A and Group N classes of the World Rally Championship through the 1990s. Ralliart (later Mitsubishi Motors Motor Sports), was Mitsubishi's racing subsidiary, although the company ceased competing formally in 2010. 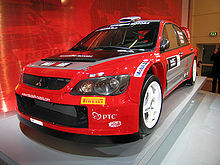 Mitsubishi is also the most successful manufacturer in the history of the Dakar Rally. MMC's maiden entry was in 1983 with their new Pajero, and it took only three attempts to find a winning formula. Since then, they have won in 1992, 1993, 1997, 1998, and between 2001 and 2007, an unprecedented seven consecutive victories and twelfth overall with nine different drivers. They also won the 2003 FIA Cross-Country Rally World Cup, along with Carlos Sousa. Mitsubishi has had a 30-year-long association with actor Jackie Chan, who has used their vehicles almost exclusively in his movies throughout his career. The Jackie Chan Cup, first held in 1984, is an annual celebrity auto race involving international motor journalists and starlets from across Asia in Mitsubishis with professional touring car drivers alongside for assistance, and was held before the Macau GP until 2004 when it moved to Shanghai. In September 2005 Ralliart, Mitsubishi's motorsport arm, produced 50 Jackie Chan Special Edition versions of the Lancer Evo IX; Chan acts as the honorary director of Team Ralliart China. The company has vehicle manufacturing facilities in Japan, Philippines, and Thailand, and twelve plants co-owned in partnership with others. In Brazil, it has a production agreement with a local group with no direct investment from MMC. It also has three further engine and transmission manufacturing plants, five R&D centres and 75 subsidiaries, affiliates and partners. Its vehicles are manufactured, assembled or sold in more than 160 countries worldwide. Born, Netherlands: Netherlands Car B.V. (NedCar), shares sold in 2012. Normal, Illinois, United States: Mitsubishi Motors North America, Inc (MMNA). Opened in 1988, closed in 2015. Karawang, Indonesia: Mitsubishi Motors Indonesia (MMI). Opened in 1988, closed in 2015. ^ "Mitsubishi Motors Announces Production, Sales and Export Figures for March 2017 and for the 2016 Fiscal Year" (Press release). Mitsubishi Motors. 27 April 2017. Retrieved 2 October 2017. ^ a b c d e "Annual Report 2017" (PDF). Mitsubishi Motors. pp. 24, 29. Retrieved 2 October 2017. ^ "Mitsubishi Motors Corporate Social Responsibility Report 2016" (PDF). Mitsubishi Motors. p. 1. Retrieved 2 October 2017. ^ "Mitsubishi to assemble vans, trucks in China". Nihon Keizai Shimbun. Tokyo: 12. 1 March 1986. ^ "The trouble with excellence". The Economist. 4 July 1998. Retrieved 5 April 2013. ^ a b c Souppouris, Aaron (20 April 2016). "Nissan outs Mitsubishi for cheating fuel economy tests". Endgadget. Retrieved 26 January 2019. ^ "Nissan to take 34% stake in Mitsubishi Motors - BBC News". Retrieved 1 July 2016. ^ McCurry, Justin (25 November 2018). "Carlos Ghosn sacked as Mitsubishi Motors chairman". The Guardian. Retrieved 26 January 2019. ^ "Notice regarding conclusion of a principal agreement on share transfer of the European subsidiary production site" (PDF). Mitsubishi Motors. 11 July 2012. Retrieved 20 January 2014. ^ "Volvo säljer sitt innehav i Mitsubishi". Aftonbladet (in Swedish). 11 April 2001. Retrieved 27 June 2017. ^ "Mitsubishi Lancer 2.0 Di-D GS4". Auto Express. Retrieved 12 May 2016. ^ Motor business international. Economist Intelligence Unit. 1995. p. 43. ^ International Motor Business. Economist Intelligence Unit. 1989. p. 59. ^ Block, Gordon (20 June 2011). "Nissan and Mitsubishi officially name their minicar joint venture". Torque News. Retrieved 26 January 2019. ^ "VDL Groep takeover of NedCar a done deal". 1 October 2012. ^ "Mitsubishi throws in towel on fading era". 29 July 2015. ^ "Union workers say goodbye to 27 years at Mitsubishi plant". 30 November 2015. Archived from the original on 2 December 2015. ^ "Mitsubishi's existence at risk as fraud case widens". Automotive News Europe. 27 April 2016. Retrieved 27 April 2016. ^ "Mitsubishi Motors says cheated on mileage tests for 25 years". Reuters. 26 April 2016. Retrieved 26 April 2016. ^ "MMC execs deny involvement". The Japan News. 27 April 2016. Retrieved 27 April 2016. ^ "Nissan to Take $2.2 Billion Stake in Scandal-Hit Mitsubishi Motors". Retrieved 18 May 2016. ^ "Mitsubishi: U.S. cars not affected by fuel economy scandal". The Car Connection. Retrieved 9 May 2016. ^ Yuri, Kageyama (18 May 2016). "Mitsubishi Motors president to resign over mileage scandal". AP. Retrieved 18 May 2016. ^ Mukai, Anna (20 January 2011). "Mitsubishi Motors to Introduce Eight Hybrid, Electric Car Models by 2015". Bloomberg.com. Retrieved 16 May 2012. ^ Greimel, Hans (4 February 2014). "Mitsubishi, in naming Aikawa as next president, declares its independence". Autonews. Retrieved 26 April 2016. ^ "EERE News: Mitsubishi and Subaru Launch Electric Cars in Japan". Apps1.eere.energy.gov. 10 June 2009. Retrieved 4 December 2009. ^ "EV WORLD INSIDER: Bill Moore's Perspective". Evworld.com. 2 November 2009. Retrieved 4 December 2009. ^ "UPDATE 2-Mitsubishi to cut price of electric cars - Nikkei". Reuters. 18 June 2010. ^ "Mitsubishi Wins Dakar Rally Victory -- Again". BusinessWeek. 23 January 2007. ^ "Good Times in 1988 Mitsubishi Colt Jackie Chan Trophy". Mitsubishi Motors: International Quarterly Magazine. Japan: Mitsubishi Motors. 1 (34): 16. 1989. ^ "Jackie Chan kicks back". The New Zealand Herald. 10 September 2005. Retrieved 25 October 2011. ^ a b "Mitsubishi amplia produção no Brasil". Estadão. Retrieved 13 May 2016. ^ "Mitsubishi Auto Gallery". Mitsubishi. Mitsubishi. Archived from the original on 2017-02-13. Retrieved 28 December 2016. ^ "Mitsubishi Motors - Conheça a linha de carros 2016". Archived from the original on 2 February 2014. Retrieved 12 May 2016. ^ "Press Release - News･Events - MITSUBISHI MOTORS". Retrieved 12 May 2016. ^ "Mitsubishi Motors en Venezuela - . :: Mitsubishi ::". Archived from the original on 5 June 2016. Retrieved 12 May 2016. 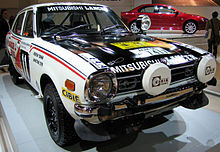 Wikimedia Commons has media related to Mitsubishi Motors and Mitsubishi vehicles.